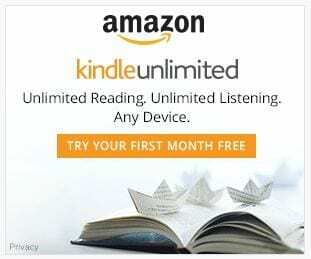 The winners have been announced for the Edible Book Festival, sponsored by Zoe at Playing by the Book, so I am now free to share my entry. (Participants were sworn to anonymity until the judging was complete.) Presenting…….. 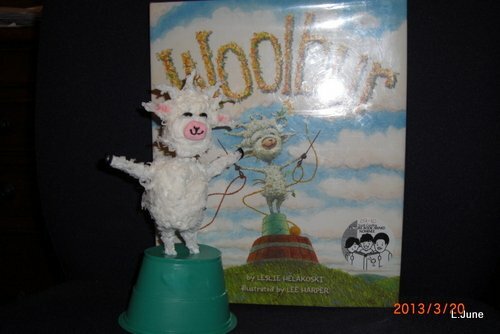 I was inspired by one of my favorite picture books, Woolbur by Leslie Helakoski, illustrated by Lee Harper. 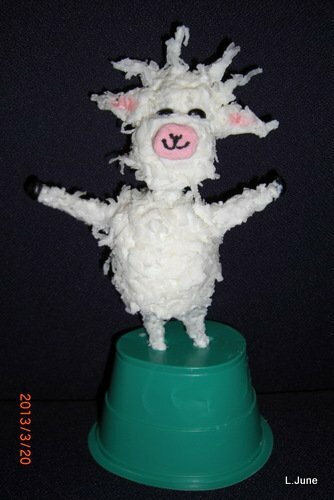 He created Woolbur with paint, but my version had to be entirely edible, so I used marshmallows (jumbo for the body, regular for the head, mini peppermint for the muzzle), white frosting, coconut flakes, thin pretzel sticks, dried black beans for the eyes and hooves, and a little red food coloring on the ears. In hindsight, I wish I had taken some process photos, but my hands were SO sticky from beginning to end that it’s probably best I didn’t! I’m wondering if there would be any interest from students if I sponsored an Edible Book Contest at my school as part of Children’s Book Week? I’d love to see what they might come up with! You can go here to see all the other entries. So much creativity – I’m glad I didn’t have to judge! 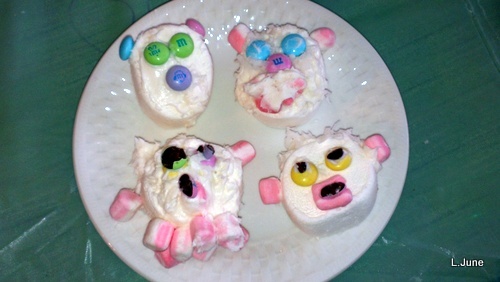 Edited 4/9/13: Just had to share a follow-up to my Edible Book Festival entry. 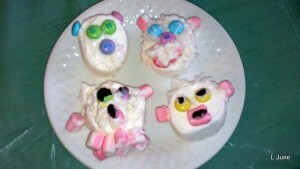 On Easter Sunday the kids in the family used my leftover Woolbur ingredients to create their own lamb faces! 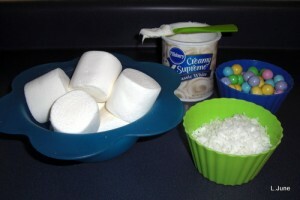 They had a ball smearing frosting, sprinkling coconut, and placing M&Ms just so. Many thanks to Zoe for inspiring this new family tradition! This entry was posted in Books, Special Event, Yay Me! and tagged SPECIAL EVENT. Bookmark the permalink. ← (Empty the Shelves) Challenge Accepted! ha! I did wonder about sticky hands – the texture of Woolbur was so amazing. Does your school have a home economics (cookery) department (I don’t know how common this is outside the UK) – could you team up with them? Oh that is wonderful! It’s put a big smile on my face!